Captions: 1. See saw, up and down we go! 2. 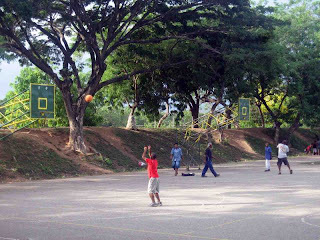 Gerehu basketball court 3. 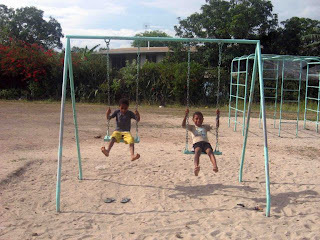 My children at the Gerehu playground. Powes Parkop is showing his mettle as Governor of the National Capital District. He must be supported in his campaign to resume all public parkland in Port Moresby that has been acquired – legally or otherwise – by business interests. Mr Parkop has flung down the challenge by ploughing a strip of land between the South Pacific Brewery and Boroko Foodworld, opposite Courts store at the brewery roundabout. This land, and others around Port Moresby, has become a park and children’s playground and Mr Parkop has declared he will go to gaol if necessary to reclaim it for the public. That’s the kind of determination that has been missing from the NCDC leadership for decades – not empty sabre-rattling, but a refusal to be bullied by businessmen whose dubious deals that have seen them squat on undeveloped parkland for many years. 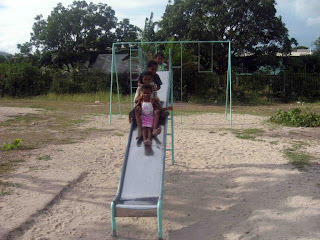 I live at Gerehu, and whenever I can, I take my children to the playground when they can slide, see-saw, swing, climb like a monkey, or roll on the sand. Thanks Mr Parkop, and keep up the good work. After being away from Port Moresby for a while I am amazed at the changes that have taken place around the town. Powes Parkop should be congratulated. It is not just children that benefit. The sculptures and Rugby posts are being enjoyed by everyone. Even the Erima entrance / exit to the airport has been improved.